"I own records that have the power to make me cry. 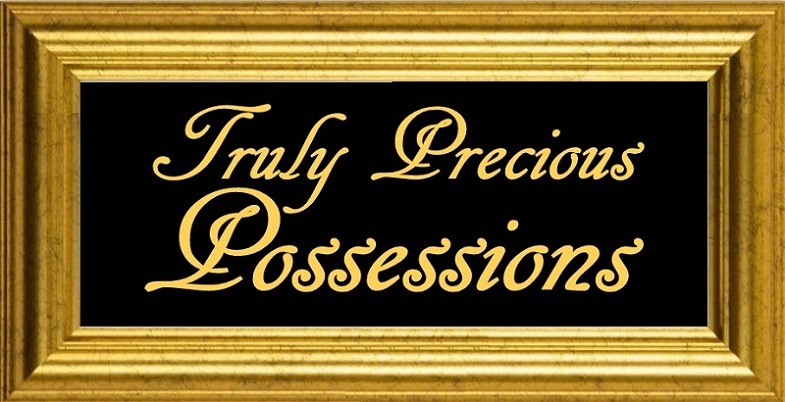 Records to BE by or with - truly precious possessions." 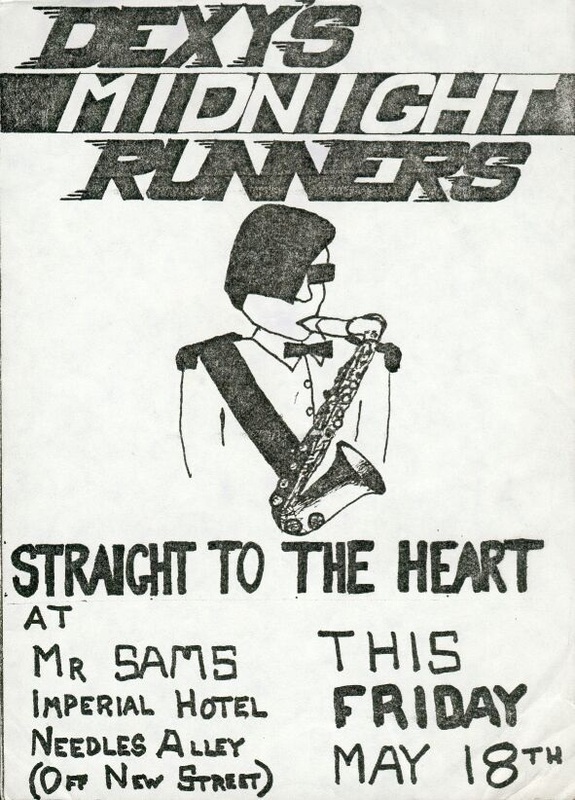 This flyer dates from May 1979 and is from one of Dexys earliest gigs. It was donated to the site by Dexys saxophonist, Steve Spooner. The flyer was self produced, hand drawn, photo copied and distributed by the band themselves. The artwork is by Big Jimmy Paterson and is a drawing of Geoff Blythe. 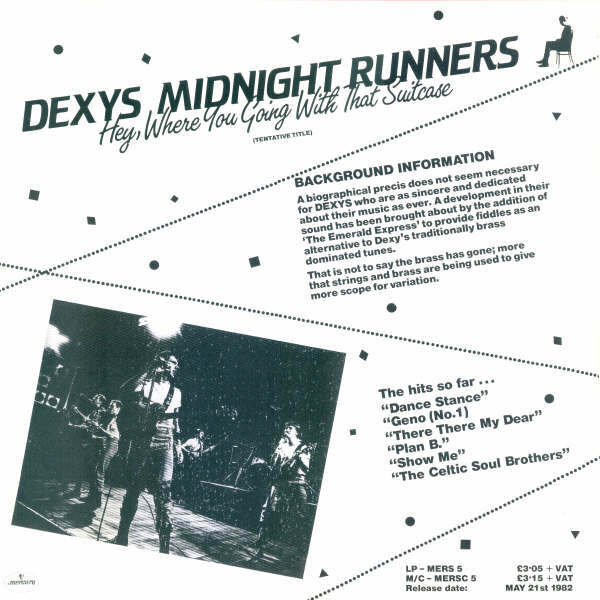 It illustrates that Dexys earliest image was quite different from the Docker Chic of Searching For The Young Soul Rebels. Geoff's hair was shaved on one side of his head and grown long on the other some years before Human League's Phil Oakey did the same. As has been mentioned in the past it could have been that Dexys had more in common with the New Romantic movement had the image not changed. Johnny Rogan (in a Record Collector interview, 2000): "Was the song ["Keep It - Part Two"] a cry for help, declaration of passion, or an attempt at self-sabotaging Dexys' success? It would have been much easier to have pushed something like "Seven Days Too Long". " 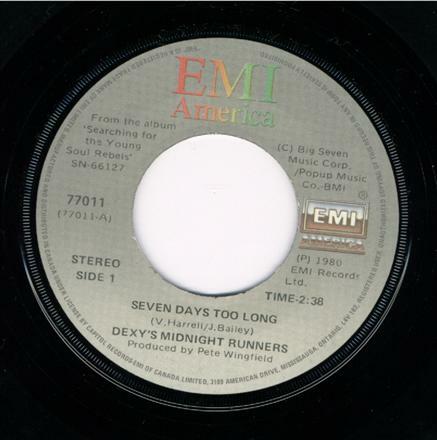 Kevin Rowland: "That was a consideration, actually..."
In Canada, releasing "Seven Days Too Long" as a single was more than just a consideration - it actually happened. 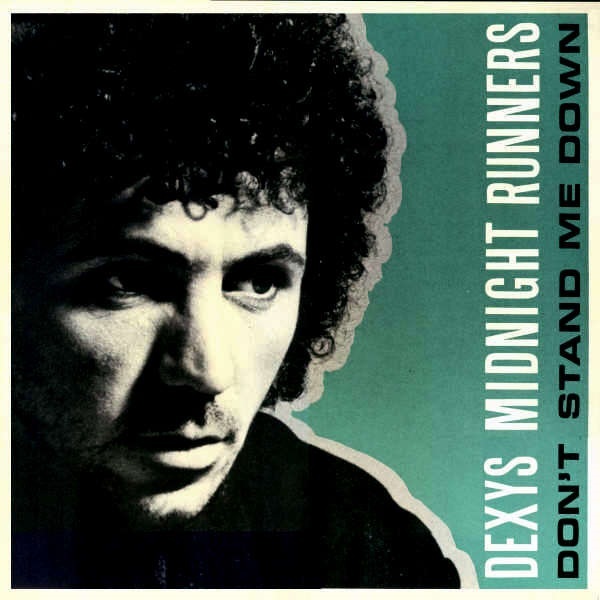 The resulting record has turned into one of the most sought after Dexys rarities. Indeed it is so seldomly seen, many fans had begun to question its existance, wondering if it was just a rumour started by record dealers. One theory suggested that it might have been released as the b-side to "Geno" in Canada and that this may have been the source of the claims that it had been a single. A blurred photo was the only evidence we had and it was frankly inconclusive. Finally Bazza managed to get his hands on a copy and supply us with a scan which proves beyond doubt that "Seven Days Too Long" was 'SIDE 1' of the record in question (the b-side being "Geno"). Another mystery solved and a great little item if you can track it down. HEY, WHERE YOU GOING WITH THAT SUITCASE? 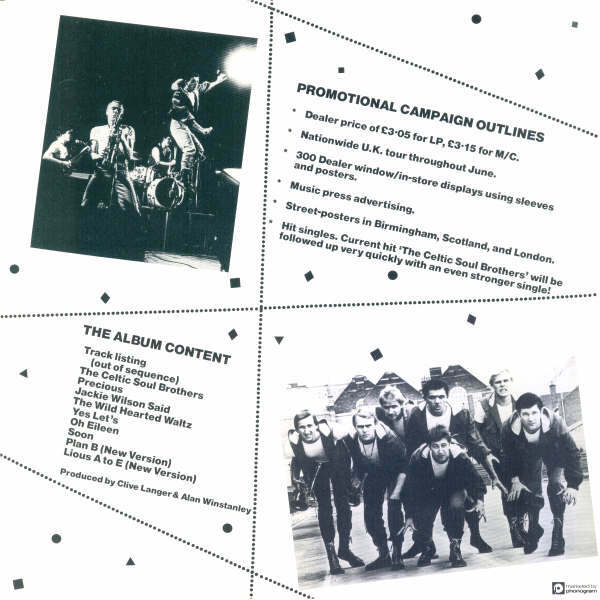 The track-listing in particular shows that the album was far from completion when this artwork was produced. "All In All (This One Last Wild Waltz)" is listed as "The Wild Hearted Waltz", while "Let's Make This Precious" is described simply as "Precious". 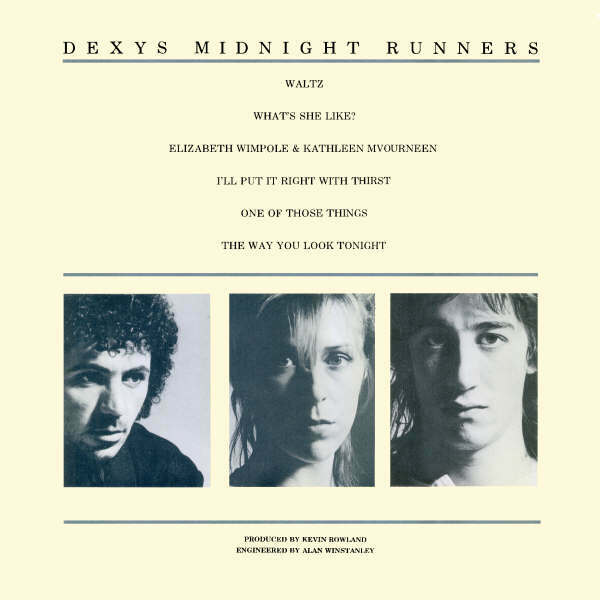 There is no "Come On Eileen" but both "Yes Let's" (the song which became "Come On Eileen") AND "Oh Eileen" are listed - although it is possible that this is one title ("Yes Let's - Oh Eileen") split over two lines. 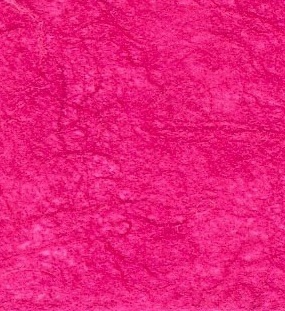 The album name itself is described as a "tentative title" and it would appear there was no vinyl produced to accompany this artwork. 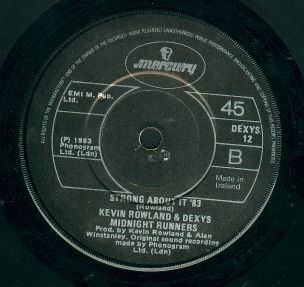 Even though this may not be everything that it is sometimes claimed to be, it does represent a fascinating artefact from a pivitol moment in Dexys' history as they stood on the threshold of international superstardom - which arrived with the subsequent releases of "Come On Eileen" and "Too Rye Ay". Thanks to BillHiicksWasGoodForMe for the above scan. Johnny Rogan (in the same Record Collector interview): "On some pressings of "Jackie Wilson Said" there was a mispressed B-side with the song title Howard's Not At Home" in place of "Let's Make This Precious". What's the story there (showing him the disc)?" Kevin Rowland: "That's amazing. 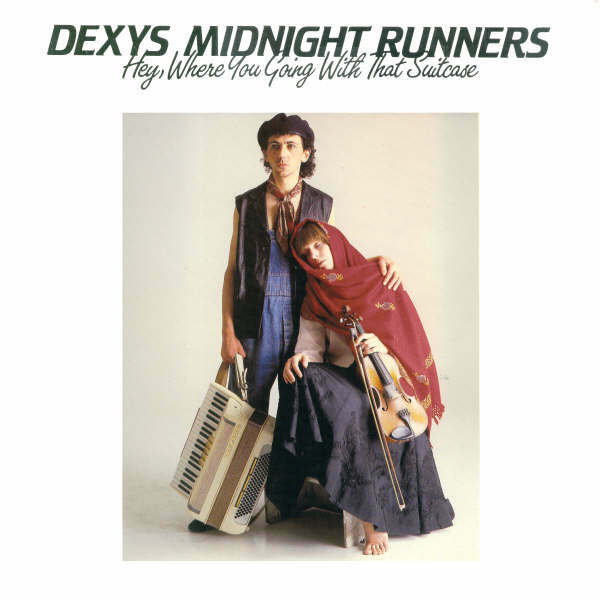 I never thought I'd forget any Dexys songs. What's it go like? Oh, it plays "Let's Make This Precious"? I see. It was a title. When I was in the Killjoys in 1978, I had that "Howard's Not At Home" title. I was writing this song and my brother said "what's it called?" and I said "Howard's Not At Home". That's funny because the A&R man in our life just before the Killjoys were breaking up was Howard Thomson. Later they must have asked me what my new song was going to be, and I said "Howard's Not At Home". That's how that would have worked. And then we said, "put 'Precious' on there instead"." Surely one of the most bizarre rarities - not just in terms of Dexys releases, but in pop music history - a label for a song which never existed! The record does indeed play, as "Let's Make This Precious" which was the B-side on the standard issue of "Jackie Wilson Said", but the details - including the "Rowland/Adams" writing credits - are unique to this fictional song. 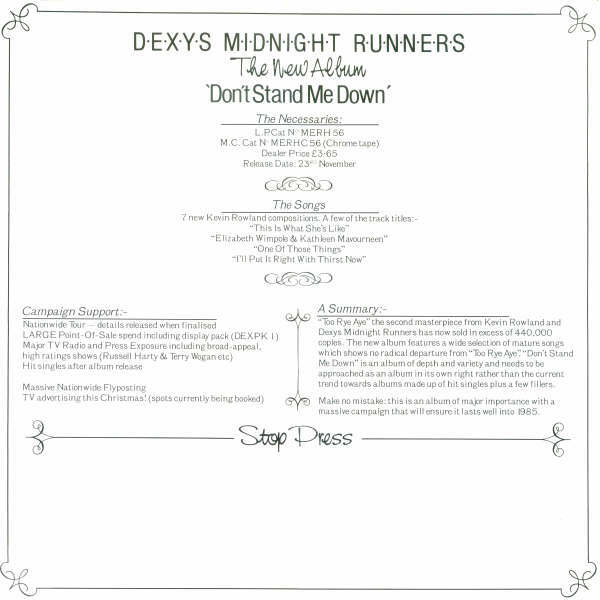 The "directed by" credit for Dexys' long-time designer and graphic artist, Pete Barrett is probably an indication that this label was not a particularly serious piece of work and was never intended for public release. This obscure item is the B-side label for the"Celtic Soul Brothers" re-issue from 1983, as it was released in Ireland. 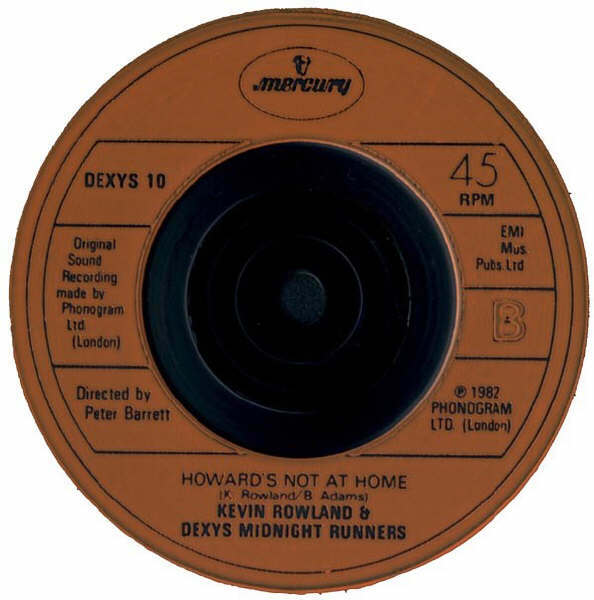 As with "Howard's Not At Home", this is (unfortunately) not an undiscovered Dexys song but plays the same as the B-side on the standard release: i.e. "Reminisce - Part One". However, in this instance, it seems likely that this was an alternative name for "Reminisce - Part One" - especially given Kevin Rowland's tendancy to re-title his songs. There is, of course, a line in the song which states: "I wrote this down on a piece of lined white paper while I still felt strong about it." so this may well have been a working title for the song which was perhaps retitled after the Irish pressing plant had already printed its labels. Scans courtesy of Bloxy's collection. (Record Collector, 2002): "Mercury even put together a mock-up cover to show to retailers, and create interest. "It was a mad idea" recalls Rowland, "People evidently needed to see something. It was a gatefold sleeve with pictures of bridges on the Thames. And 'Dexys Midnight Runners' suspended on ropes, dipped into the water, and pulled up with the water dripping down from it. While in Montreaux I got the idea for the other one. Maybe I should have stuck with the first one." 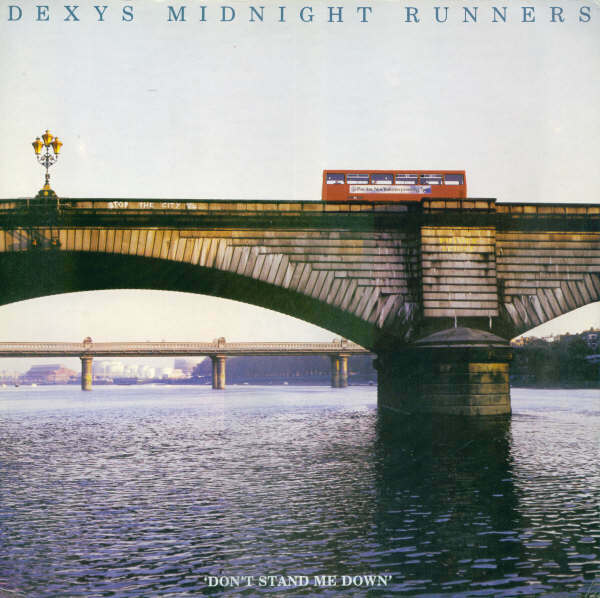 "
This early artwork for Dexys third album, featuring a striking image of Putney Bridge, complete with a number 85 bus advertising "Pan Am. New York every evening 7pm." might well have proved a more commercially appealing cover than the one chosen but it is difficult to say if it would have made any major difference to the ultimate success of the album. As with the mock-up artwork for "Hey, Where You Going With That Suitcase", the track-listing shows that the album was very much a work in progress when this was produced. Titles such as "What's She Like" and "I'll Put It Right With Thirst" demonstrate that Kevin was still working on the exact names of the songs at this time, while the inclusion of the eventual out-take "The Way You Look Tonight" shows that the album content had yet to be finalised. The listing for "Elizabeth Wimpole & Kathleen Mavourneen" is something of a mystery since the original title of "The Waltz" was supposedly "Elizabeth Wimpole & Kathleen Ni Houlihan" but there is a separate listing for "Waltz", whilst "Kathleen Mavourneen" was a traditional Irish song covered by Dexys around this time. Thanks to Bloxy for sharing the above item. 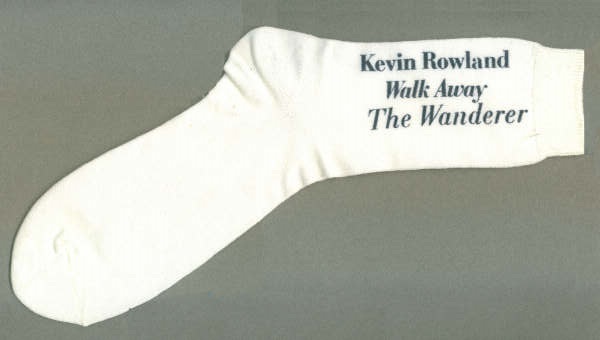 A curious 'foot-note' to this selection of Dexys-related artefacts, these socks were produced as a rather unusual piece of promotional material to coincide with the release in May 1988 of Kevin Rowland's debut solo single, "Walk Away". Unfortunately they failed to help the song gain a foot-hold in the charts!